You can recognise the diary by icon. The diary may be a personal one or group-specific. Your teacher can determine whether the entries in your personal diary can only be seen by the teacher or whether they can also be viewed by other students. A group-specific diary is the joint diary of all workspace members. The contents of the diary appear on the left and the details of the authors on the right. If your personal diary is also accessible to other students, their names appear on the right. 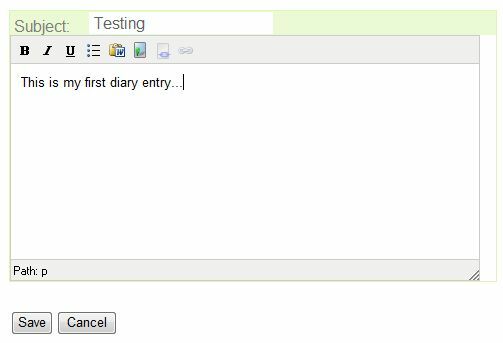 By clicking ‘New entry’ you can open the window in which you can write new diary entries. Write the header in ‘Header for entry here’ and the contents in the text field. You can format the text (bolding, italics, underlining, listing) and attach images in Optima to your text. You can also create a link to Optima or the Internet. Remember to save your entries. The teacher and (depending on the diary settings) other students can read your entries and comment on them. After your entry has been commented on, click the ‘Show comments’ button under the entry to view the comments.